The adventurers strike back! 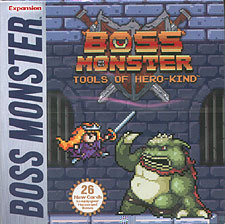 In the original Boss Monster, Heroes are puny resources to be gathered and slain. But in Tools of Hero-Kind, they put up more of a fight! This mini-expansion introduces new Item cards that make Heroes more formidable. Defeat these heavily-armed Heroes, claim their Items, and gain new offensive abilities! Power up your game with 20 Item cards, 4 Advanced Room cards and 2 Spell cards.